"Liu" (from "Turandot" by G. Puccini) would be one of the most sympathetic operatic characters. She is certainly not a modern woman if you ask me. However, every woman has a little bit of "Liu" in her heart, and that is why this character speaks to us so dearly. I myself cannot help but shedding a tear or two whenever I see the opera although I would detest women like Liu in real life (if they ever exist, anyway). 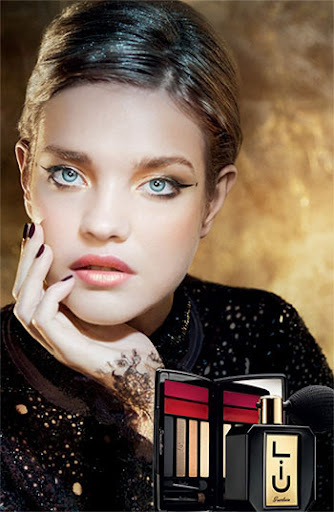 Guerlain has captured this helplessly beautiful character into a makeup palette for the holiday 2012. I was very excited (and nervous) to create a look using this palette. I really like the cake eyeliner. I used this liner dry and it still creates great definition. I filled my folds with the eyeliner after I flicked the lines first, then blended it with the warm gold and greige shades finishing with highlighting in the shimmery ivory color. I chose the warmer toned red lip color today pairing with matte brown pink blush. The warm gold eyeshadow color is my favorite. It is surprising since I usually shy away from any warm toned colors, but it adds such a luxurious feminine touch to the whole look. I will try a couple more looks, maybe soon I will come up with a perfect party look for this holiday season. Liu's Aria "Signore, ascolta (Lord, listen)"
In this aria, poor Liu pleads with the prince Calaf confessing her love for him. "Sir, listen! Ah, sir, listen! Liù can bear no more! Ah!" Did the prince Calaf listen to her? No, of course not. He was no different from any other men. What do you think of this look and the palette? it is a real standout among all the holiday makeup collections. Lena, you did an excellent job with that palette! Your look is exquisite :) Love the eye makeup and lippy. hi, Sarah! how are you doing? i want something brown and black..
i agree gold and red are not my comfort zone colors, but they work pretty well altogether. Liu is an amazing character. i am glad to see a collection like this from a power house like guerlain. Wow I love the theme of this palette :D you look amazingly glamorous in this look! I dont think the red lips look too much on you, it looks gorgeous!! Really beautiful and cute makeup! and thank you for your kind compliment! Thanks for introducing the character to us, and man what a look! Really can't wait to see this palette in person! You should try more golds because this one works really well o you! I love the look they suggest and the more realistic look you came up with. I also love love love your lippy color! I just got the high definition powder from e.l.f and I really like it! Oh Lena, I adore your look, the lips make it even more amazing! You really did a great job on the whole look and you are just so stunning! The lip color is so pretty on you! lol. you always make me blush! Ooh...I am an uncultured fool! I didn't know about this opera, thank you for the link and story breakdown! Lol @ your dislike of Liu though...I find myself often feeling the same way with some of the kdramas I want (yes, I just compared Kdrama to opera, please don't shoot me). I think this look is very beautiful and classy on you. You can definitely wear more warm and/or gold eye shadows! but then, there is that music. it makes everything beautiful. LOL. Well...I guess opera has an older history, so rather old-fashioned. Hmm maybe they'll do a kdrama remake of Turandot someday? ahahaha Then I can watch it, lol. Lol @ cheesy stuff. Hmm I think I like sweet, but not too cheesy. Of course, I wouldn't mind living in a fantasy! XD But seeing the huge gap between fantasy and my "real" life is quite disheartening, keke.